Jogging is, by its nature, dangerous. One of the obvious hazards of jogging is the face plant. Nothing can ruin your chances at keeping all your teeth or of going out on the town Friday night with Miss [insert the name of your state here] 2011 as fast as tripping over your feet while you’re jogging. In that moment, you know you’re going to fall and there’s nothing you can do about it; it’s as inevitable as Reality TV shows dominating network TV for the upcoming season. Worse, you have just enough time to realize that you don’t have enough time to stop your fall with anything other than your face. This pain is soon followed by the inevitable gibes of your friends when they found out that the reason you were at the ER was because you decided to get some exercise. They’ll point out that they were perfectly safe while they were down at the pub drinking a pint. Another standard hazard of jogging is getting hit by lightning during bad weather. But that’s your own darned fault for jogging in the rain. Finally, of course, there’s the chance of keeling over from a heart attack if you’ve been spending most of your time in a pub tossing down pints rather than having ever jogged before. However ominous these dangers are, though, there are other, sneakier, cleverer, more dangerouser dangers that are relatively unknown. They’re out there, waiting. Oh, sure, it looks like they’re minding their own business, collecting acorns and Mardi Gras beads in anticipation of winter, letting bygones be bygones while families barbecue, frisbee throwers frisbee, and joggers jog, but in actuality they’re just looking for their moment to rise up and ATTACK! In addition to the inevitable coming of the squirrelpocalypse, the jogger has to worry about what may be the greatest danger of all: co-eds. The chance of a co-ed (for us guys) or a frat boy (for you ladies) going jogging at the same park as you is high, especially if you live in a college town. The chance of your significant other finding out that you were running backwards for almost a quarter of a mile while checking out said co-ed/frat boy passing by is even higher. At that point you’ll be glad that you’re already at the ER, having managed to trip over your feet and face planted. Then, too, there’s always banana peels. 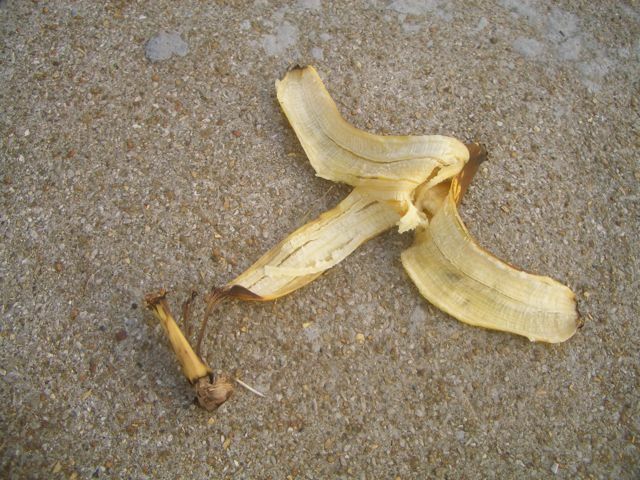 This photo, 'Banana Peel on a Sidewalk', was re-created by professionals. Don't try this at home--it's far too dangerous. I was jogging along earlier today, minding my own business and absolutely not looking at any co-eds who were also at the park when, suddenly, as I came up on a blind corner I saw that there was not one, but two banana peels lying on the path! Only incredible nerve and amazing reflexes allowed me to react in time to dodge them safely (that and the fact that my jogging speed is only a wee bit faster than continental drift). Heart still pounding in my chest when I was safely on the other side of the obstacles, I looked around, wondering who might have accidentally or intentionally been the instigator of this slapstick Three Stooges skit in the making. Was it the guys in the ambulance who were parked not far away? Sure, they looked like they were eating an early lunch of tuna sandwiches, but could bananas have been involved? Or were they maybe trying to drum up some business the old-fashioned way? Or had my girlfriend wanted to curtail my co-ed watching? Er, I mean, been completely mistaken about my co-ed watching in a funny Romantic-Comedy-misunderstanding way? The peels might have been meant not to kill, but only to maim in order to keep me safely at home on the couch, watching Reality TV shows. Then I saw him. He was lurking behind a tree, beady little eyes tracking my movements, sharp little teeth bared in what I could only guess was an evil grin. The author hasn’t been heard from for several days. Squirrels of interest are being questioned about his disappearance. Follow him @Parablehead on Twitter or on his blog at goblinbrook.wordpress.com. This entry was posted in Observation Deck. Bookmark the permalink.